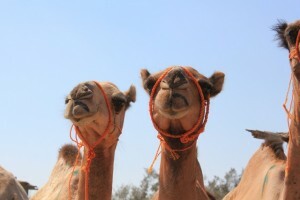 This client inspired blog tells us of their experience of visiting the Birqash camel market in Egypt. During our recent trip to Egypt, we had the best adventure ever! We spent some time at the Birqash Camel Market called Souq al Gamaal by the locals, just outside of Giza about 40 minutes’ drive from downtown Cairo and there in a delicious atmosphere of seeming chaos were hundreds of camels for sale. Some of them were hobbled and I guess these were the ones who had tried to run off previously but most were roaming around freely. It was great! Each camel has Arabic writing on its side and we found out this was the name of the owner of the camel so that they could tell who owned what in the ever changing melee. Through the help of our guide, Mohammad, we priced several (quite expensive as it turns out with prices starting from a minimum of the equivalent of 200 euros) and I tried to trade for my husband, but the sellers weren’t interested when they found out he had no experience in herding camels. However the real bargaining between traders is hard and furious as the best prices are negotiated right in front of you. We got a real sense that just as the monuments and temples we had seen reflect an ancient civilisation, here was traditional centuries old custom still taking place right before our eyes. Can I exchange this camel for my husband? Most of the animals are sold for meat and have been herded up the Nile valley all the way from Sudan and Somalia on the famous 40 Day Road. This ancient caravan route starts in Sudan and ends in Birqash. 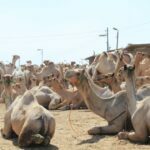 The camels are herded through Sudan, Eritrea, and Somalia to southern Egypt and this is a journey of over 700 miles and takes about three months on the road. We had tea with some of the sellers and took lots of photos. One of the elders wanted copies of the photos so our guide addressed an envelope in English and Arabic for us to use to send them. When we posted the photos, the local postman said “Really?” Perhaps the first time a letter has been sent to “The Camel Market, Cairo, Egypt” from our rural village in Ireland! Hope it gets there. After the Birqash market we stopped at a roadside stand and sampled camel heart and liver sautéed with chillies, onion and bell pepper tucked inside flatbread, tasty although maybe not for the fainthearted and in fact that goes for the whole market experience!!! 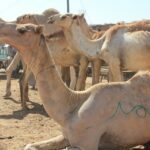 If you can see beyond the harsh realities of the conditions and treatment of the camels you do get a glimpse of real African life here. Final tip is for the ladies – the Birqash market is all male traders so dress modestly.